How to create and use a color option? How to create a color option? How to use a color option for a customizable product? 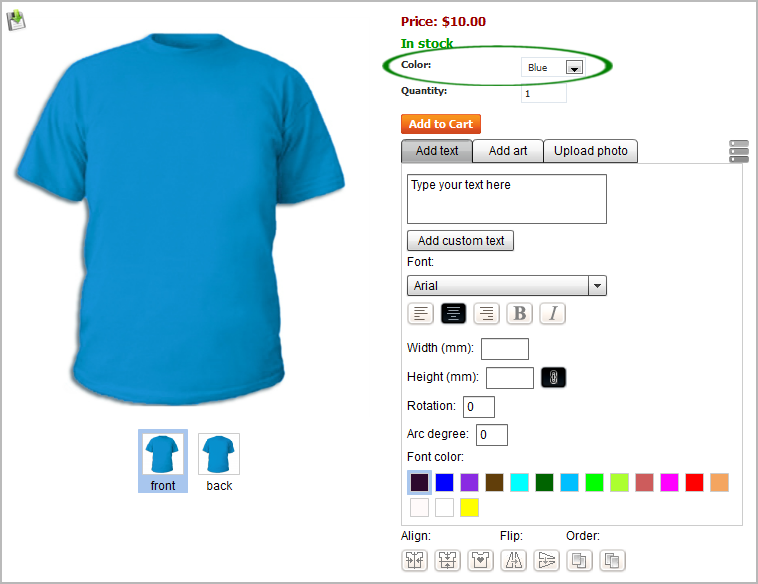 Color option will allow your customers to choose the color of a customizable product. It's a convenient option for such products as t-shirts, mugs, caps, bags and other products which can have different colors. 1. In order to create a color option, please log in to your admin panel and go to Products -> Products -> Edit your product -> "Options" tab. Name – Name of the product option as it appears in the customer area. 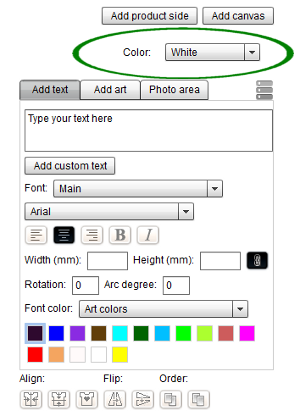 Type – Type of the product option: Select box, Radio group, Check box, Text, Text area or File. 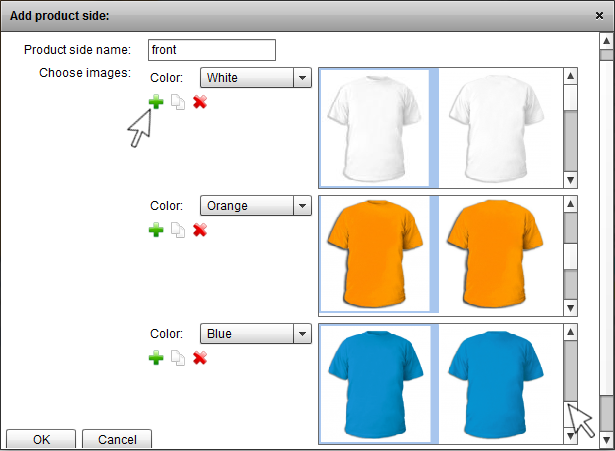 For creating a color option, choose a select box. After that open the "Variants" tab in the same window. Complete the Name input field (e.g. White). In the Modifier input field, if you wish you can set the price that will be added to the product price if this option is selected. To add more variants, click on the Add empty item icon. Description – Description of the product option as it appears in the customer area under the question sign (?) next to the option name. Comment – Comment which will be shown below the option in the customer area. Required - If selected, this option will be mandatory for selection. Now, your color option is created and you should go to the "Product designer" tab to specify images for each color option variant. 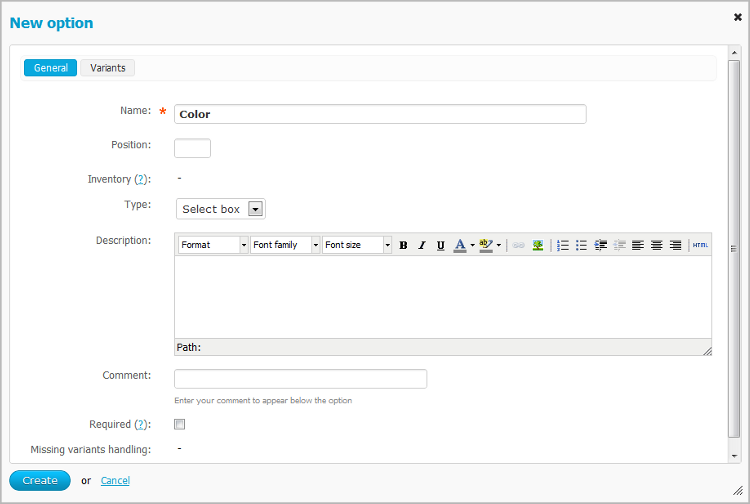 After creating a color option, please go to the "Product designer" tab on the product editing page. Now you should add a product side for each color option variant. Note! Before adding a product side you have to upload additional images of your product for each color. You can do it on product editing page -> "Images" tab. 2. If necessary, enter the product side name. 3. From the drop down list near "Color" choose the necessary color variant. 4. Choose the corresponding image. 5. Press "Add empty item" button to add more variants. Note! If you have different product side images of the same color (in our example - front and back images), choose front images first and then press "OK" button. Then repeat all steps (1-7) for back images, etc. 8. After adding all product sides, don't forget to press "Save" button which is located in the left down corner of the "Product designer" tab screen.